Why don't you walk on your soil early in spring when it's soaking wet? If you've got clay soil, like me, look between the beds & you'll see why. That is the very same dirt I was growing things out of last year, tamped down with big rain boots when it was wet. Now I have smooth pathways between my beds. I still have to pull weeds in the walk-ways every now and then but those are getting fewer & farther between! There is lettuce in the feed-bin because I sowed that really early so I could bring it in if it got too cold. It did not grow very well & is still too small to eat. The hose is just one that sprung a leak. I took a thumb tack & poked holes all through it to make a soaker hose . I'm trying all different methods of keeping weeds down this year. So you can see grass clippings in my cauliflower bed. There is newspaper on the farthest right bed that had onions & carrots. There are black plastic (garbage bags) in the pepper bed down the end. So far, not sure which I like the most, the garbage bags was probably the least amount of work & it warmed up the soil really nicely for the peppers. Left bed in the front (off to the side of picture) has peas & a couple cauliflower. 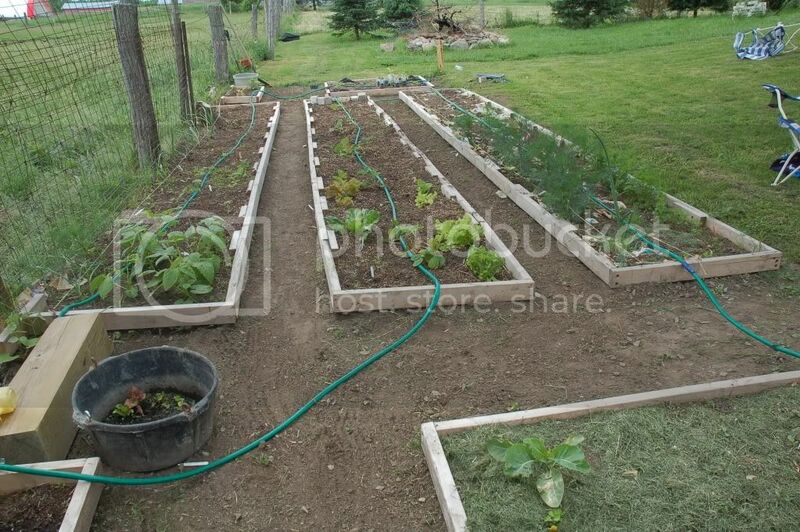 Right bed in the front (off to the side of picture) has cauliflower & celery. Left long bed has beans & a couple tom plants (the rest are on the fence by the field - top of picture), garlic, some beans & peas. Middle long bed has strawberries, lettuce, arugula (although not right now since the flea beetles ate it all! ), spinach, & radicchio if it ever germinates. Right long bed has onions & carrots & dill. Back bed to the left has cucumbers, a zucchini that couldn't wait (was really dieing), mint that I just planted today and a raspberry plant. Back bed to the right has bell peppers & is holding a few of my squash plants in their containers . Poor little squash are hanging out with the peppers, just waiting to be planted. I should be doing it later tonight, I just need to borrow a tiller. Looking good... like your long narrow beds. Everything looks very tidy, well cared for and organized! Where's the Giant Pumpkin Patch? Did you see my Atlantic Giant and Bushel Gourd seedling photos? This will either be a total disaster with 1/2 the front lawn swallowed up, or it will turn out to be a model front yard Edible Landscaping. Can't tell which, and I'm not telling DH that's what are planted there until he notices. Looking great! 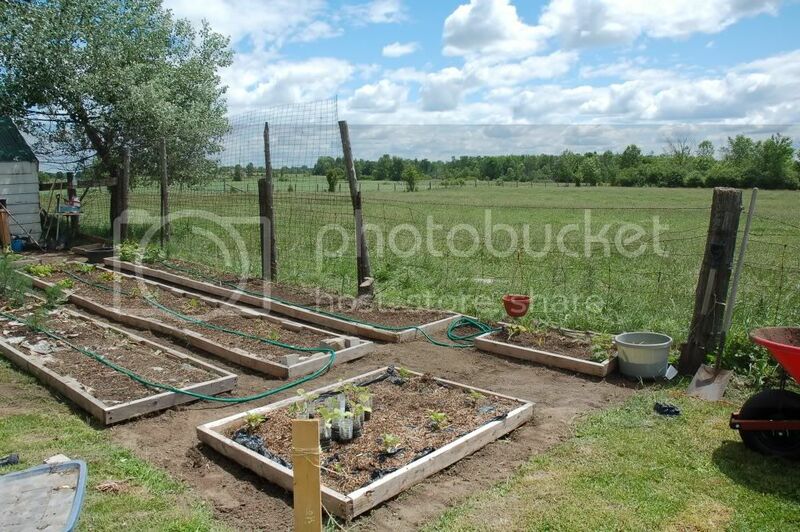 Keep us posting on your garden's progress. The pumpkin patch is at the top of the first photo, in the field beside the house . I'm waiting to rotto-till it with the neighbour's powered tiller, but we ran out of time tonight. Oh well, maybe tomorrow! My pumpkin is sitting, very impatiently, in a sunny spot next to the house - it's already sprouted male flower so I REALLY need to get it into the ground!! !